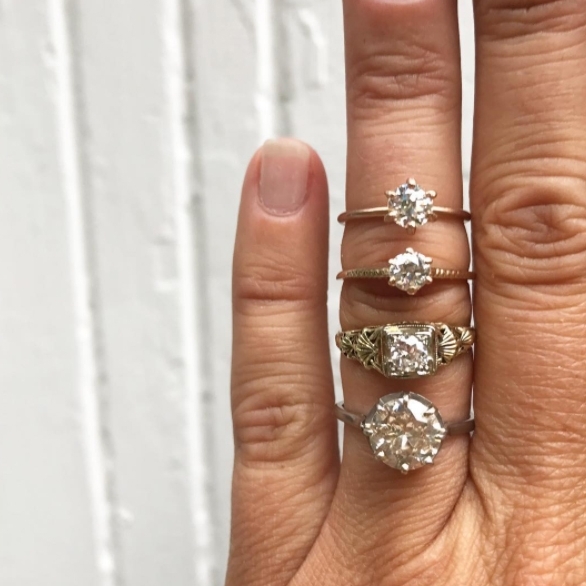 Any time a client is searching for a diamond we always start by introducing them to these gorgeous vintage options. These are diamonds that were mined and cut around 100+ years ago… resulting in stones that have a luster and mystique all their own. For years these stones have been re-cut which is why there aren’t as many of them left on the market today. This re-cutting in our opinion cut away the character and life these stones possess. We believe these stones to have incredible market potential in the long run because there are only so many of them and finding them will become harder and harder to do as time goes on. The value of these antique stones has increased in the last 20 years due to their increasing rarity and they are also considered non-conflict as well as earth friendly. We have a passion for saving these antique stones from the chopping block and finding customers who value them as we do! Each of these stones reflect their story….if only they could talk and tell us where they have been! These diamonds are in every sense of the word… ROMANCE. Now this is not to leave these beauties out!! They too have a romance all their own. While OMC and OEC Diamonds come in primarily round or cushion shapes, and in some rare cases we can find Antique cuts in Oval, Pear, Emerald And Marquise shapes. Modern cuts come in all of the shapes and sizes and many more options as far as the 4 C’s go. These shapes include the Oval, Round, Princess Cut, Emerald Cut, Pear, Asscher Cut, Marquise, and more! The most trusted diamond grading agencies are the GIA and EGL. They grade stones based on the four c’s… Carat Weight, Color, Clarity and Cut. Relying on these agencies gives us confidence that what we are spending our hard earned money on is genuine and can give us perspective on how these different qualities affect the pricing. Modern cut stones as well as Vintage stones alike are all graded by these same standards which gives us further confidence and understanding to what we are looking for. Searching for the most diamond we can get within your budget is one of my favorite things to do. Once you can establish what this budget is We can go to work and 'mine' for that perfect stone that gives you the most bang for your buck. Visit GIA.edu for more of the most thorough and reliable information on diamonds. Perfect example of Old European Cut vs. Modern brilliant Cut.